When we talk about art that reconciles political, spiritual, and social beliefs all in one pertinent statement—and I’m certainly not talking about ancient Assyrian art, Jacques-Louis David, or Andy Warhol—it is hard to think of anyone who sums it up quite like Gonçalo Mabunda. A lot of contemporary African art deals with the conflict that evolved between social groups after the end of “colonialism” (I call it “invasion and occupation by European countries”). The Mozambican Civil War began two years after Mozambique became a free state (1975) from the Portuguese. It was a conflict between indigenous Front for the Liberation of Mozambique (a Russian-socialist inspired group) and the Mozambican Nationalist Resistance. The war was exploited by the South African white government to undermine the National Resistance’s support of African nationalist groups in its own country. The war ended in 1992 after the collapse of the Soviet Union and South African Apartheid regimes. Mabunda, who spent his entire childhood in the violence of the civil war, took part in the reconstruction of his country through art directed as a healing element, determined to exchange weapons for farm tools. Soon after the civil war ended, Mabunda became a gallery director at the Núcleo de Arte, a collective of sculptors in Maputo. He subsequently studied metal and bronze sculpture at the Natal Technikon in South Africa, now part of the Durban University of Technology. A religious organization formed the Arms into Art project in 1997, which was when Mabunda started working full time as an artist. Mabunda is best known for his throne-chairs. 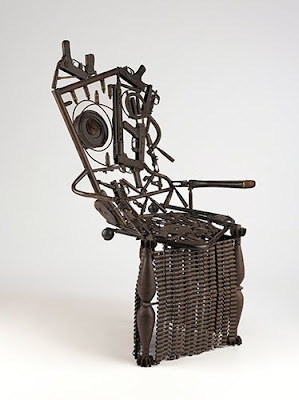 By creating chairs made out of weapons that he experienced during the civil war, the artist negated their evil and the atrocities committed with them. In the genre of collective memory, he expresses not only a moving on from the violence of a power struggle, but also makes comments on the colonialism that fermented the war. He links the weapons-chairs to African tradition, proposing that the lust for power is similar in both Africa and the West in a single work of art. Chairs, or rather stools, have been symbols of an African ruler’s status and power in Sub-Saharan Africa long before Europeans arrived. They were the literal seat of power, and conquered village leaders used them as representations of loyalty to the ruler. For instance, in Ghana, traditionally the stool used by a ruler was put in a family shrine after his death and venerated on special occasions to honor his wisdom and leadership. During the August Yam Festival in Ghana and Nigeria, state stools were traditionally brought out, washed, and fed the new yam crop, an important subsistence crop in the region. 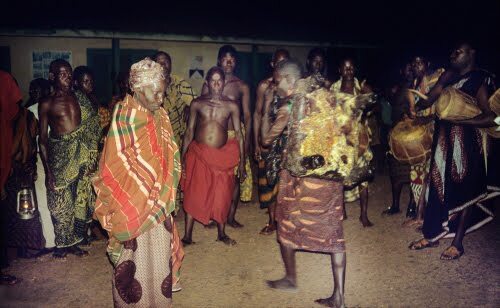 Sometimes, family members of the deceased ruler danced with the state stool as a sign of respect. 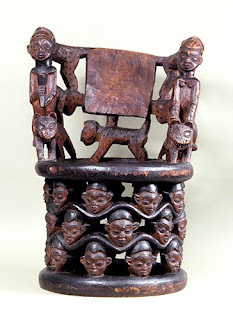 The chair form was introduced to African peoples (the Chokwe at first, now in Angola and Democratic Republic of Congo) by Portuguese invaders during the 1500s. The form was adapted by many cultures across the region of equatorial Africa as a symbol of authority because of its size. In the Cameroon Grasslands, chairs such as this are valued as symbols of royal prestige and authority. Kings commission such chairs when they first take power as a symbol of their status. The heads on the base of this chair represent rulers who passed prior to the ruler who commissioned the chair. This makes the chair a potent symbol of the wisdom and royal status of the ruler. It is unusual that it shows both male and female figures riding leopards, the leopard being a symbol of royal strength and authority.